Have you ever wanted to take a trip to the Dinosaur Island, Jurassic Park that you have seen in the movies, then this is your chance. This 3-reeled classic slot will take you to the world of dinosaurs, minus all of the danger that you have seen in the movie. On top of that, it will let you capitalize on the great winning opportunities that the game has in store. The game has a great jackpot that can amount up to 800 to 1600 coins, depending on the wagers that players have placed. If they placed a 1 coin bet, they will earn 800 coins and they will earn 1600 coins if they have placed the 2 coin bet. 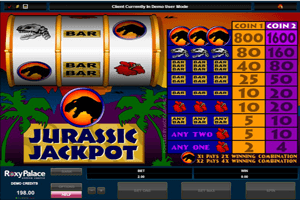 Play Jurassic jackpot Slot here. This jackpot is triggered when players get 3 of the highest paying symbol on the payline of the game that they will find in the middle of the reels. This high paying symbol is none other than the Dinosaur silhouette symbol. On top of being the highest paying icon the game has, it is also a wild symbol that can replace any other symbols to help players in earning a payout. It will also double or quadruple the payout it helps in forming. The payout table of the game, just like classic slots, can be found on the left side and it is divided into 2 columns to show the different payouts for the 2 different betting options, 1 or 2 coins.